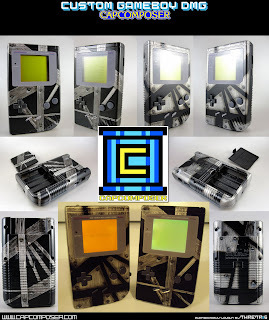 Capcomposer: Pair of Custom gameboys, made to order! Pair of Custom gameboys, made to order! I just finished up these two gameboys for someone. I am very happy with how they turned out! Both are backlit with Nonfinite's v2 kits, pro-sound modified, and the orange backlit one is underclocked too.... There is more in the my flickr gallery and some are soon to be available for purchase at project gameboy.